In this article, we will discuss the comparison between Provolone and Muenster, two kinds of cheese that look quite similar to each other. Both of them are smooth and often used for various foods, including sandwiches and burgers. So, what are the differences between Provolone vs Muenster? Which one is better? First of all, know that these two kinds of cheese originated from different countries. 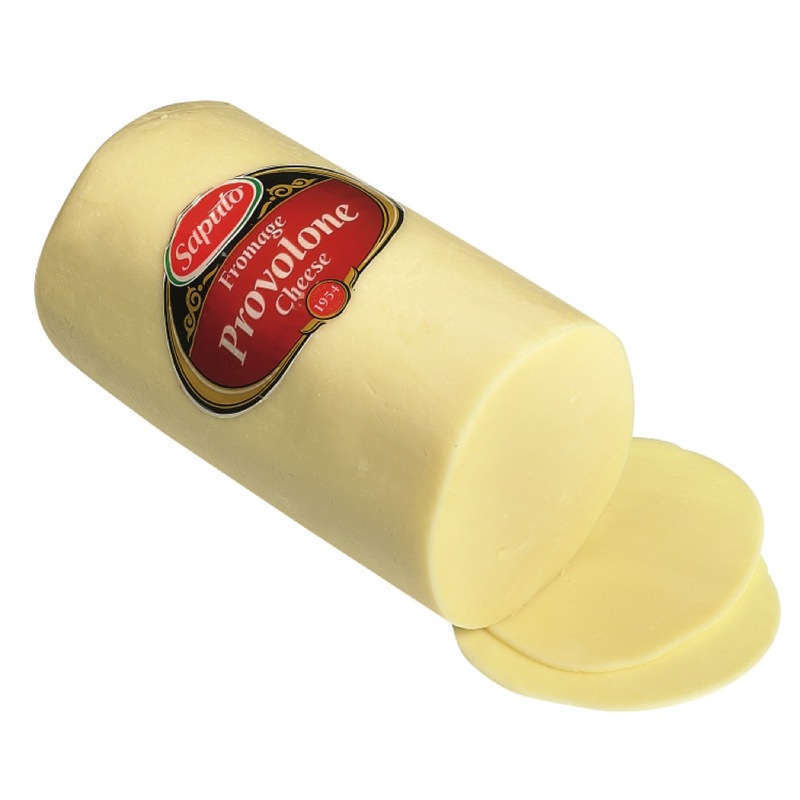 Provolone is an Italian cheese. You can consider Muenster as an American cheese. See also: Mozzarella vs Feta. Provolone is an aged pasta filata (stretched curd) cheese which originated in Casilli near Vesuvius. It is now still produced in various shapes of cone, pear, and sausage varying from 4 inches to 6 inches. Nevertheless, the term “Provolone” appeared for the first time at the end of the 19th century, when the cheese was manufactured in the southern Italy. However, many other countries have started producing the Provolone cheese as well, including the United States. Muenster, according to Wikipedia, is a semi-soft cheese that originated in the United States. Most people believe that the Muenster cheese originated from the Alsatian Munster cheese introduced by German immigrants. The name was based on the city of Munster located in Alsace, France. 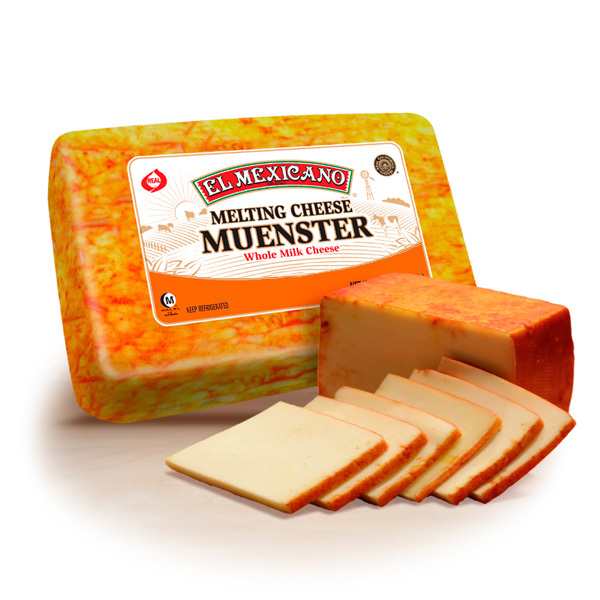 There is a cheese named Munster-Gerome protected by the AOC; the “Muenster” name distinguishes the two cheeses. 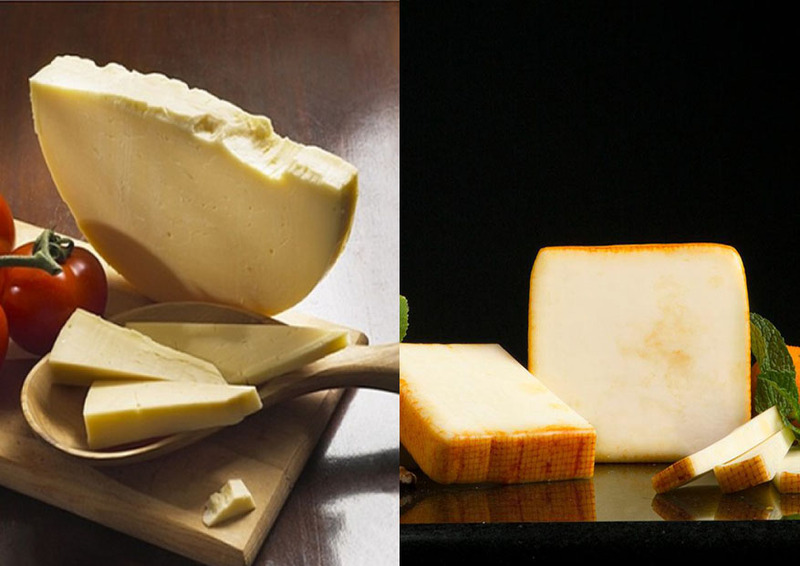 Both Provolone vs Muenster are used in many popular foods because of their nice texture characteristics. Both are semi-soft cheeses. However, they are not completely similar. Provolone has a body that is somewhat firm but still smooth and easy to cut. The color is pale. The rind is also rather pale. The texture is somewhat grainy. As the effect, Provolone can’t be grated, but it can be shredded quite well. Otherwise, you can just slice it into thin, wide sheets. Muenster, on the other hand, is somewhat softer. The color of the cheese is pale, but the rind is typically orange. It is smooth and moist. Hence, you can’t grate it. You can freeze Muenster in order to make the texture a bit firmer so that you can shred it. Without freezing it first, it will be quite difficult to shred. Or, you can just slice it into wide sheets. Note that the moist texture of Muenster creates excellent melting properties. When melted, the cheese turns into a nice yellow liquid form. Then, once it has cooled down, it will be turn back into a somewhat solid form. This is why this cheese is very popular for grilled and baked foods. As a matter of fact, the flavors of both Provolone and Muenster may vary significantly. So, you need to be careful when choosing and purchasing a cheese product. You may want to make sure that the cheese has the flavor that you want. Usually, manufacturers label their cheese products with recognizable labels. Provolone is typically buttery and tangy. However, the flavor varies from provolone dolce (which is sweet and jut mildly sour) to provolone piccante (which is sharp and piquant). The differences in the flavor are caused by different aging durations and different sources of lipase. The dolce version is aged for just a short time and uses calf’s lipase. The piccante version is aged for at least four months and uses goat’s lipase. Muenster is typically made from cow’s milk. The making process also involves a seasoning called annatto, which is sweet and nutty, and is responsible for the orange color of the rind. Muenster usually comes with a mild flavor. However, the taste may vary from product to product. Some products can be bland, but some others can be sharp. When it is properly aged, Muenster can create a strong flavor that is accompanied with a pungent aroma. Both Provolone and Muenster are used in various foods. They both are great for sandwiches. They may also be used for pizzas. Provolone, in particular, is recommended for sandwiches and Philly cheesesteaks. When used on a pizza, it is sometimes to be mixed with Mozzarella. Muenster apparently has found a wider range of suitable applications. This cheese is a common appetizer. Because of the excellent melting properties, it is often used in grilled and baked foods, such as grilled cheese sandwiches, cheeseburgers, mac ‘n cheese, tuna melts, and quesadillas. So far, we have discussed about the texture, flavor, and uses of Provolone vs Muenster. How about their nutrition? Do they provide good nutritional values? Which cheese is actually healthier? Each 100g serving of Provolone provides about 351 calories. That is pretty high. So, if you want to avoid weight gain, you should adjust your eating portion. Nevertheless, this amount of serving provides 27 grams of fat, 69 mg of cholesterol, 2 grams of carbohydrate, 26 grams of protein, and 876 mg of sodium. Each 100g serving of Muenster provides about 368 calories, which is even a bit higher. It provides 30 grams of fat, 96 mg of cholesterol, 1 gram of carbohydrate, 23 grams of protein, and 628 mg of sodium. Both type of cheese provide a variety of vitamins and minerals. They contain vitamin A, vitamin D, vitamin E, vitamin K, vitamin B6, vitamin B12, thiamin, niacin, choline, riboflavin, pantothenic acid, folate, along with calcium, iron, magnesium, potassium, phosphorus, zinc, selenium, copper, and manganese. So, Provolone and Muenster can be healthy. They provide good nutrients that are important for your body. However, you should not consume them excessively because they can have pretty high calories. Both types of cheese are great, suitable for many foods. Provolone is recommended for Philly cheese steaks. However, Muenster is generally more versatile, as it can be used as an appetizer and in many different foods. It also has slightly lower sodium content.